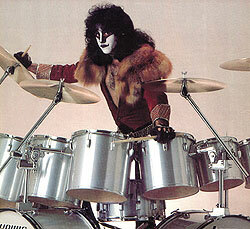 KISSROCKS.net is proud to have a section of our site devoted to legendary KISS drummer ERIC CARR, who was the musical backbone of the world's greatest band from 1980-1991. Current main features are the exclusive KISS ROCKS interview with Eric from 1989, a new interview with Eric's sister Loretta Caravello (featuring lots of great memories and stories about Eric), and much more to come. Coming soon is an Eric Carr Photo Gallery, featuring rare and exclusive Eric images over the years, handwritten personal notes and autographs from The Fox, as well as collector's info on those illusive 1980 Donruss trading cards from Australia. 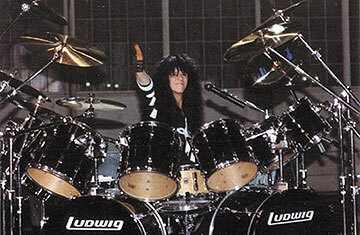 Please also be sure to visit www.ericcarr.com, which is the ultimate tribute site as well as a place to get some great official Eric Carr merchandise, directly from members of his kind and warm family. Enjoy this tribute section and please feel free to write in with any suggestions, comments, contributions, etc. GET YOUR COPY OF THE NEW ERIC CARR 20th ANNIVERSARY COMMEMORATIVE CD! 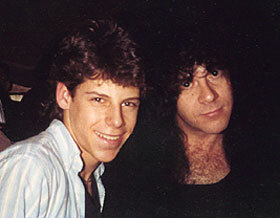 On November 8, 1989, I had the pleasure of conducting an extensive phone interview with KISS drummer ERIC CARR, which became the cover story of 2 consecutive issues of the KISS ROCKS newsletter in late 1989. Eric was fantastic to speak with, as he was funny, endearing, open and honest as always. It was a real thrill to chat with him for that long, and an honor that I'm proud to share with all of you. EXCLUSIVE INTERVIEW WITH LORETTA CARAVELLO, ERIC'S SISTER & FOUNDER OF ERICCARR.COM! In February 2005, Eric's sister Loretta Caravello was kind enough to do an interview with KISSROCKS.net, looking back on Eric's time with KISS as well as answering some detailed questions about his former bands, his audition experience with KISS, band relationships, the KISS reunion tour, conventions, fans, etc. Some truly great input from a great woman! Tons of Eric photos, including never-before-seen live photos throughout Eric's time with the hottest band in the world. The ultimate tribute site to The Fox! Great photos, merchandise, memorabilia and links. Plus the official home of the Rockheads! Eric was always about his fans and constantly made them a number one priority. Anyone who ever met Eric, obtained his autograph or was lucky enough to receive anything from him in the mail, came away with the rare feeling that this rock star actually cared. And as we all know, he really did. SERIES 1 1980 REVISED KISS CARDS FEATURING ERIC CARR! Everyone knows KISS put out 2 different series of trading cards in the 1970s (#1-132), but not everyone knows that in Australia in 1980, KISS released a revised version of Series 1 cards from 1978 (a.k.a. "Series 3 1980"), where all of the Peter Criss cards - with the exception of one - were replaced with brilliant colorful cards of new drummer Eric Carr. All group shots were changed to reflect the new line-up (thus the addition of Paul, Gene & Ace Dynasty/Unmasked-era photos), and a total of 18 new images were added/changed to the revised set (#1-66). Although all of the cards still read "Aucoin Mgmt. 1978" on the front and many '78 images were not changed, every single card in the set was updated to include a new 1980 group image w/Eric on the back of the cards to create a large puzzle. Because these were never released in the U.S., these cards are extremely difficult to find and have become one of the most sought-after collector's items bearing the mark of The Fox! SOON YOU WILL BE ABLE TO SEE ALL OF THESE RARE 1980 COLLECTOR'S CARDS RIGHT HERE! CLICK HERE TO PURCHASE YOUR SET OF THESE BEAUTIES!